The most frequently-recurring thought I have while exercising is that I really need to vacuum. Distractions abound when you're doing push-ups on your family room floor but noticing the ground-in Goldfish cracker crumbs and the balled-up socks that were abandoned by a child and stuffed underneath the couch. I'm not especially coordinated. I'm not exceptionally fast. I'm not overwhelmingly skilled at any one athletic endeavor. But, I am a proponent of living an active lifestyle and making time to exercise regularly. This is because I've had seasons when I haven't exercised regularly. When life gets uncomfortably busy, I've unwisely skimped on sleep and cut out exercise -- ironically, the very things that make me more productive and balanced. At first, I don't notice the toll it takes, but after a month (or three), damage has been done. Tense shoulders. Built-up stress. Decreased energy. This year I've committed to being good to myself, and part of this is accepting and honoring the fact that how I treat my body affects not only my body, but also my mind and emotions. Interestingly enough, I've found that my biggest hang-ups to exercise are peripheral details. I'm slow to change into work-out clothes, especially when the weather is cold. I'm resistant to getting sweaty in the middle of the day and needing to shower again. I'm expecting that the kids will revolt if I'm engaged for a half hour, and either a) climb on me while incessantly asking for a snack, b) request my immediate participation in a craft requiring fine-motor skills, or c) trash-talk by telling me that what I'm doing "doesn't look that hard." But, most days, I attempt to bite the bullet and plunge ahead regardless. Stick to a schedule. I carefully consider what days I can realistically fit a 30 minute workout, and I mark it on my calendar. Once it's part of the weekly plan, I'm more likely to commit. Make it visible. Setting my work-out clothes and shoes someplace prominent serves as a helpful reminder. Be flexible. I've accepted that taking a shower at four in the afternoon is just as valid as taking one in the morning. You might have no problem accepting this. For me, it was oddly revolutionary. Prepare a diversion. Each time I put in a Jillian Michaels DVD, I invite the kids to the kitchen table and introduce an activity that will occupy them for 30 minutes, like Play-doh, Legos, or painting. They've learned that I can't respond articulately while I'm doing squats and presses. I've learned that they're capable of entertaining themselves for a half hour. Involve the kids. You can burn some serious energy chasing after kids. We play tag in our house, as well as a variation called tails where we tuck a dish towel in our back pockets and try to snag each others' towels. Most often, this game is stopped after someone has collided into another person. Or a piece of furniture. Or a wall. Moral of the story: watch out if you or your children are injury prone. Remember the goal. Grace, grace, grace. Exercise shouldn't be about beating yourself up, nor should it be focused merely on physical results. When I devote 30 minutes for my health several times each week, I'm showing myself kindness. I'm investing in my long-term well-being. I'm saying that I'm worth taking care of. I'm just a typical woman with three young kids. I feel lazy and skip days. I eat cookies after I exercise. I have workouts where I lack oomph and go through the motions in a floppy, uncoordinated haze. Even so, I keep lacing up my shoes because the benefits are too good. When I'm doing well, I have more to give to others. Plus, like I mentioned, from that plank pose on the family room carpeting I'm getting an up-close look at where I need to vacuum. And vacuuming absolutely counts as exercise, right? 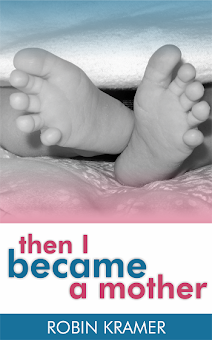 Humor, hope, and encouragement for moms: Then I Became a Mother. Available in both Kindle and paperback formats. Great post! I used to exercise regularly but lately have been making up excuses not to (most of the ones you mentioned, in fact!). This is just the push I need! Thanks! Ann, you are so welcome! I've found that it's hard to get back in the routine when I've been off of it, but I've just accepted that I need to jump in feet first. And, ugh, those first few days do hurt a bit, but it's a good kind of hurt, right? I hope all goes well for you! I love the treadmill, but it's currently stashed behind an excessive amount of toddler furniture, requiring a minor renovation to unearth. Also, it's so LOUD! I can't realistically use it during the day or I wouldn't be able to hear if the girls were screaming at me... hmmm... wait a minute.... and I'd also need a lot longer than 30 minutes. What would you recommend as an alternative? Robin! These are such great tips! I agree with making it visible... otherwise it can be "forgotten". I *love* this! It's so rare to read fitness advice that sounds like it comes from a real person! I sooo relate to the idea that changing clothes and showering are obstacles to exercising. I've never heard anyone else express that--such an "ah ha" moment when I read it. Thank you for such a motivating article! 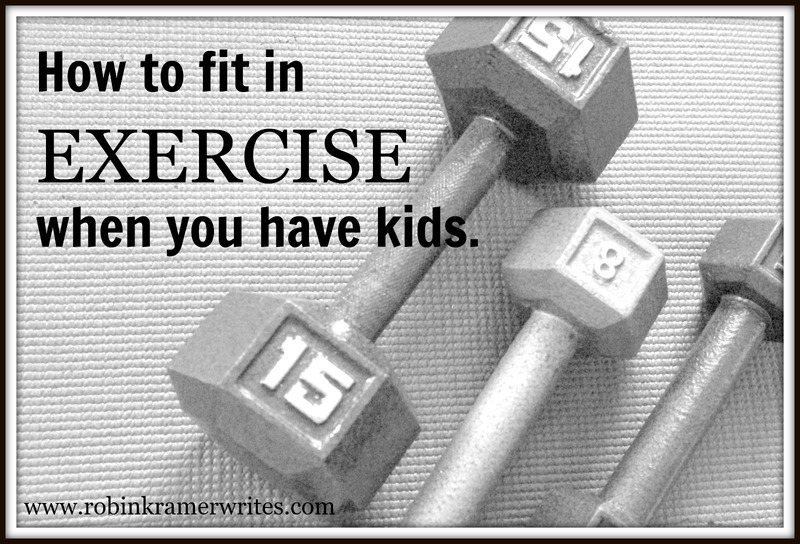 One other tip is finding a mommy and me exercise class. I go to a yoga class that a mom hosts in her backyard, and we often look like your second picture. It feels good to exercise in such an accepting setting. Your tip on the exercise class is a terrific one. Having friends to motive you and hold you accountable (and who understand when you're being mauled by a toddler) is a wonderful plus!